First place prize and £500 for Corbridge CE First school. The first regional winner of JDP's Sustainability in Schools 2017 competition has been announced as Year 4 pupil Frances from Corbridge CE First School, Northumberland. Each year pupils from England, Wales & Scotland take part in the competition that aims to promote healthy living, the importance of the environment and preserving water and other precious resources. In 2017, the competition focused on forests and woodland, and the importance of these areas within the environment. Pupils were tasked with scavenging material from their local area to create a collage, while learning about trees, plants and the animals that live nearby in school. 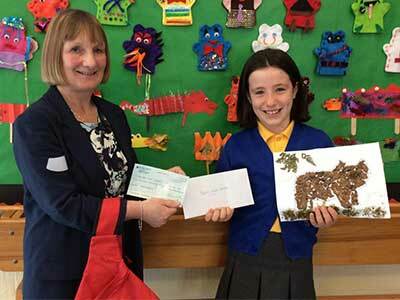 Frances, and her animal-inspired collage, came top of the canopy of a very competitive Scotland & Borders region to win £500 for her school. Pictured above is Brenda Fleming (JDP Supply Chain Supervisor) and Frances. Grace Beresford, Y4 Teaching Assistant at Corbridge CE First School, said that the children enjoyed the chance to learn outside. "The children were really engaged and enjoyed working on the topic very much. Forest school activities are very popular, and JDP gave them the opportunity to go into the woods and take part in this exciting activity." "We're really proud of Frances' achievements and we'll use the money to further benefit the children's education." Hayley Slack, JDP Marketing & Communications Coordinator, comments: "Outdoor learning is a vital part of the curriculum and encourages pupils to learn through adventure and interaction with nature. Each child received an adventure pack before their journey into the woods to aid their search and collect the best twigs, leaves, feathers and other natural materials for their collages, and they get to keep these even after the competition. JDP work with the Woodland Trust to create new native woodland to offset carbon emissions from its delivery vehicles. Next time you explore the forests in your area, it could have been planted by JDP! Frances and her collage proceed into the national round of the competition, where a further £1,000 is awarded to the best entry across the UK. The overall winner will be announced in July 2017.